I don’t know my Bolshoi from my Kirov, my plié from my fouetté, my frappé from my iced coffee, but I know what I like, and I like Birmingham Royal Ballet’s The Sleeping Beauty. We visit the theatre a fair amount for plays, musicals, random comedy acts, once to the opera, and lots of amateur stuff, but I’d never fancied the ballet. Our friend Simon, a dancer come PR man, is slowly working his way around the people of Birmingham ensuring that everyone visits his beloved ballet, and last week was our turn. I took some convincing, Simon has been working on me for twelve months. 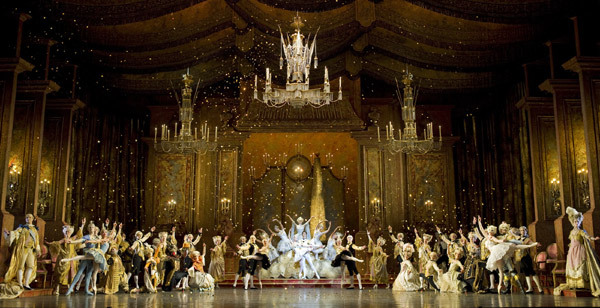 Birmingham Royal Ballet, or BRB, is one of the UK’s three largest ballet companies along with The Royal and The English National. Founded in 1947 it has changed name and moved location, residing now in Thorp Street near the gaybourhood and Chinese quarter, and is the resident ballet company at the Birmingham Hippodrome theatre. I didn’t realise until I started looking them up how respected a company they are, with frequent national tours and international tours of their productions. And so on one Wednesday evening I found myself waiting apprehensively for the sumptuous red velvet curtains of the Hippodrome to open and the show to begin. I didn’t think I recalled the story at all, but memories of being read this fairytale by my Nan did come flooding back as the curtain rose on a royal court full of courtiers and distinguished guests celebrating the Christening of Princess Aurora. Events sour as an uninvited guest, the wicked fairy Carabosse, enters regally mounted on a grand palanquin. Carabosse curses Aurora so that when she has come of age she will prick her finger on a spindle and die. The King and Queen seek the help of the Lilac Fairy, who ameliorates the curse so that instead of dying, the princess, and the entire court, will sleep for 100 years. When the court sleeps beautiful vines overgrow the palace turning it to a forest, through which a handsome prince walks. Enchanted by the Lilac Fairy he seeks out Aurora who awakes at his kiss and so the palace and its court awakes from its slumber, and celebrates their marriage. The set is large and impressive, and the costumes are beautiful. Particularly impressive costumes were Carabosse who is a vision of perfect skinned evil with black plumage, and the Lilac Fairy in a shimmering lilac lace number. The audience loved the furry cats, red riding hood and her pursuant wolf – the contrite for these characters is that they are the entertainment at the wedding of Aurora and the Prince, and they offer comedy relief from the technical tour de force of the final act (lots of pas de deux – couples dancing together, then each one solo, then together again – showing off for the audience to enjoy their perfect moves). I fear if I try to talk technically about the dancing I shall fall flat on my face. All I can say is it’s impressive. The girls are beautiful, elegant, like dolls, and just as flexible. The energy and concentration that is involved is immense, at one stage Aurora is spinning a slow pirouette en pointe (on the tips of the toe) for what seems like ten minutes, by the end of it, I was relieved she put her leg down! Poor girl, she must’ve been knackered, I was getting in to a sweat just watching her. She reminded me of the ever rotating dancer in a jewellery box. The men were just as flexible, although at one point I thought there were slightly less synchronous than they should have been, but they were strapping and handsome, and watching their discreet one handed support of spinning ballerinas was like watching a magic trick. There were points where I was convinced that one leg was going to trip up one of another eleven as dancers were in rows of ten where interlocking calves were moving like pistons. No such disaster occurred though, thank goodness. 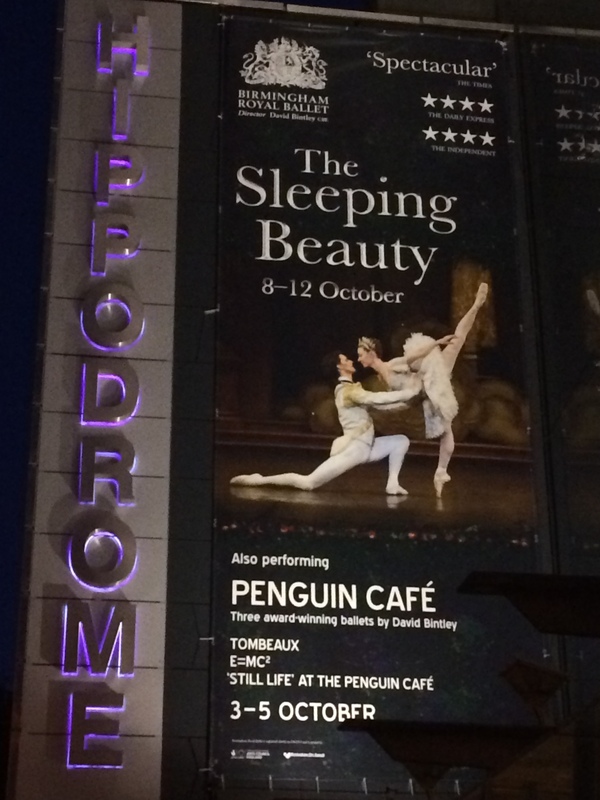 BRB’s The Sleeping Beauty is now moving to Sadler’s Wells Theatre, then Sunderland Empire, then Theatre Royal Plymouth. If you’re unable to catch one of those there are other shows coming up in Birmingham including the very popular, and apparently great first ballet, The Nutcracker. I honestly went to my first ballet expecting to dislike it, and not looking forward to explaining my dislike to Simon, however I thoroughly enjoyed it and will be back again. Thanks Simon for convincing me. Beautiful photos by Bill Cooper reproduced with kind permission of Birmingham Royal Ballet. This entry was posted in Area: Arcadian, Area: Hurst Street / The Gay Village / South Side, Venue type: Theatre and tagged Ballet Review, Birmingham Ballet, Birmingham Royal Ballet, Birmingham Sleeping Beauty, Birmingham Theatre, BRB, Out In Birmingham, out in brum, OutInBrum, Where To Go In Birmingham. Bookmark the permalink.